The performance of Advance new Terra® 28B walk-behind sweeper leaves wide-area vacuums in the dust. 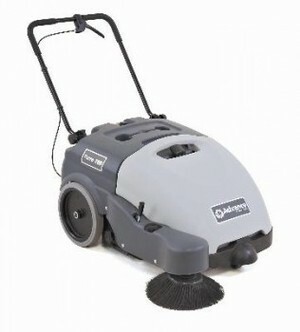 Its 28 inch wide sweep path handles carpet with 2.5 times more productivity than a 28 inch wide-area vacuum (ISSA data). Plus, the Terra 28B side broom eliminates the need for edge cleaning after sweeping. Compact and easy to maneuver for even your smallest operators, the Terra 28B is rated at just 59 dB making it one of the quietest sweepers in the industry.